For many common statistical analyses, the power curve is monotonically increasing: the more samples you take, the more power you achieve. However, in statistical analyses of discrete data, such as tests of proportions, the power curve is often nonmonotonic. A small increase in sample size can result in a decrease in power, a decrease that is sometimes substantial. The explanation is that the actual significance level (in other words, the achieved Type I error rate) for discrete tests strays below the target level and varies with sample size. The power loss from a decrease in the Type I error rate can outweigh the power gain from an increase in sample size. The example discussed here demonstrates this "sawtooth" phenomenon. For additional discussion on the topic, see Chernick and Liu (2002). Suppose you have a new scheduling system for an airline, and you want to determine how many flights you must observe to have at least an 80% chance of establishing an improvement in the proportion of late arrivals on a specific travel route. 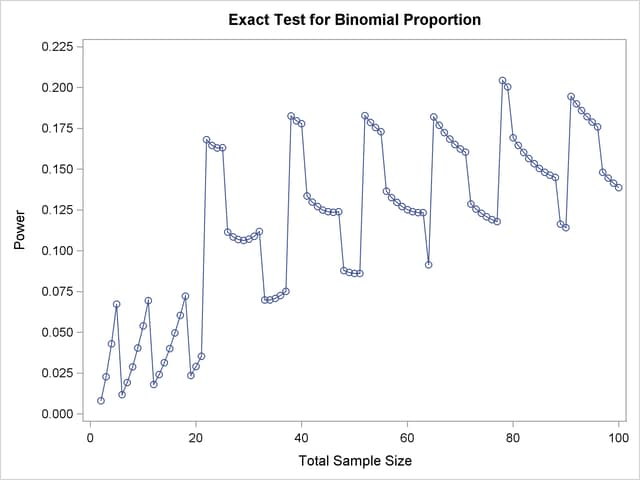 You will use a one-sided exact binomial proportion test with a null proportion of 30%, the frequency of late arrivals under the previous scheduling system, and a nominal significance level of = 0.05. Well-supported predictions estimate the new late arrival rate to be about 20%, and you will base your sample size determination on this assumption. The NTOTAL= option with a missing value (.) 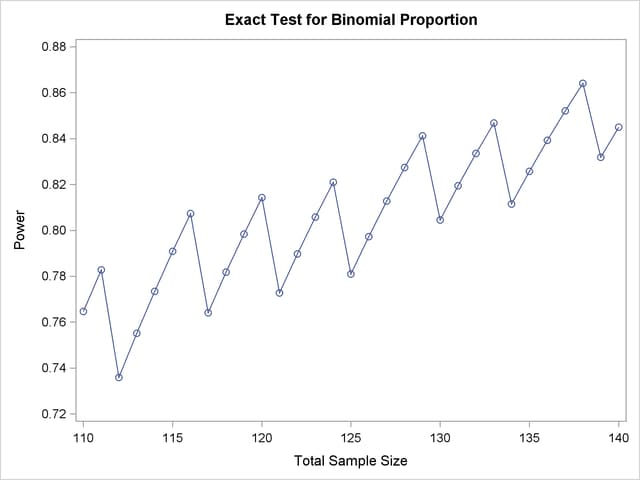 indicates sample size as the result parameter. The SIDES=1 option specifies a one-sided test. The ALPHA=, NULLPROPORTION=, and POWER= options specify the significance level of 0.05, null value of 0.3, and target power of 0.8, respectively. The PROPORTION= option specifies your conjecture of 0.3 for the true proportion. 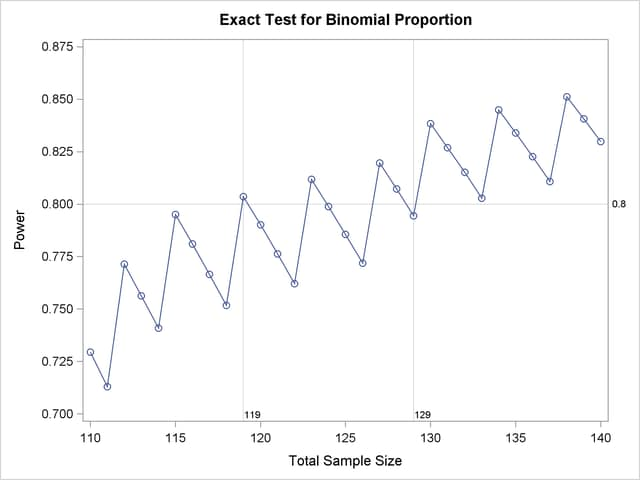 The TEST=EXACT option in the ONESAMPLEFREQ statement specifies the exact binomial test, and the missing value (.) for the POWER= option indicates power as the result parameter. The PLOTONLY option in the PROC POWER statement disables nongraphical output. The PLOT statement with X=N requests a plot with sample size on the X axis. The MIN= and MAX= options in the PLOT statement specify the sample size range. The YOPTS=(REF=) and XOPTS=(REF=) options add reference lines to highlight the approximate sample size results. The STEP=1 option produces a point at each integer sample size. The sample size value specified with the NTOTAL= option in the ONESAMPLEFREQ statement is overridden by the MIN= and MAX= options in the PLOT statement. Output 70.2.3 shows the resulting plot. Note the sawtooth pattern in Output 70.2.3. Although the power surpasses the target level of 0.8 at =119, it decreases to 0.79 with =120 and further to 0.76 with =122 before rising again to 0.81 with =123. Not until =130 does the power stay above the 0.8 target. Thus, a more conservative sample size recommendation of 130 might be appropriate, depending on the precise goals of the sample size determination. In addition to considering alternative sample sizes, you might also want to assess the sensitivity of the power to inaccuracies in assumptions about the true proportion. The following statements produce a plot including true proportion values of 0.18 and 0.22. They are identical to the previous statements except for the additional true proportion values specified with the PROPORTION= option in the ONESAMPLEFREQ statement. Output 70.2.4 shows the resulting plot. The plot reveals a dramatic sensitivity to the true proportion value. For =119, the power is about 0.92 if the true proportion is 0.18, and as low as 0.62 if the proportion is 0.22. Note also that the power jumps occur at the same sample sizes in all three curves; the curves are only shifted and stretched vertically. This is because spikes and valleys in power curves are invariant to the true proportion value; they are due to changes in the critical value of the test. Output 70.2.5 shows the plot data. Note that whenever the critical value changes, the actual jumps up to a value close to the nominal =0.05, and the power also jumps up. Then while the critical value stays constant, the actual and power slowly decrease. The critical value is independent of the true proportion value. So you can achieve a locally maximal power by choosing a sample size corresponding to a spike on the sawtooth curve, and this choice is locally optimal regardless of the unknown value of the true proportion. 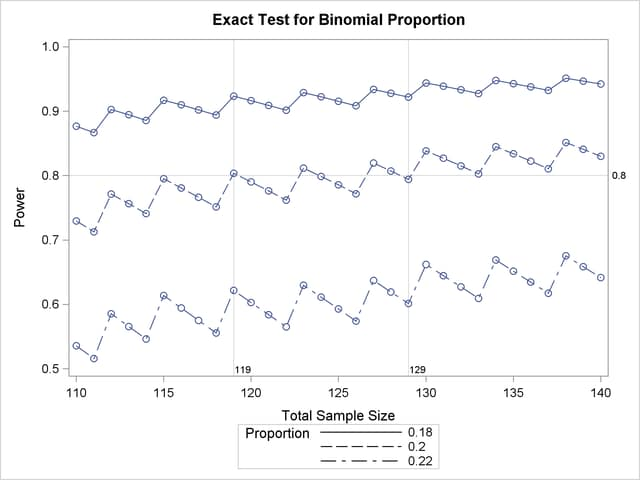 Locally optimal sample sizes in this case include 115, 119, 123, 127, 130, and 134. The resulting plot is shown in Output 70.2.6. Output 70.2.7 shows the resulting plot. Which sample size will guarantee that all higher sample sizes also achieve my target power? Given a candidate sample size, can I increase it slightly to achieve locally maximal power, or perhaps even decrease it and get higher power?